If you play video games online you know that a gaming headset is a must have. Whether you are playing Call of Duty and talking trash, or playing League of Legends and yelling at teammates a gamer needs a gaming headset. If you look online you will see many different companies offering gaming headsets like SteelSeries and Turtle Beach, but these companies are not audio companies just gaming companies. Sennheiser is a company known for their audio products and I tried their gaming headset the G4me One and here’s what my review of the headset. I have been through many different headsets over the many years I have been gaming and I have not found a headset that fits comfortably and allows for hours of wear while gaming. Most gaming headsets available are big and go over you head and fit tight over your ears. I have tried headsets from SteelSeries that I can’t wear for very long because they hurt my ears. So when I decided to buy a gaming headset I wanted to make sure this wouldn’t happen. There are actually two different types of headsets; Circumaural and Supra-aural and if you are like me you say what? Well these two scientific names actually mean over-ear and on-ear. So Circumaural headsets go over the ear while Supra-aural headsets go on-ear. I you look online at the different gaming headset reviews they will actually say which type the headphone is. My previous gaming headset was a SteelSeries NAV which is an over the ear headset and that was the cause of my ear pain. So that’s why my new headset is an on the ear headset and it maybe something to check when buying a gaming headset. After I found the difference in headsets I looked for headsets that go on the ear. 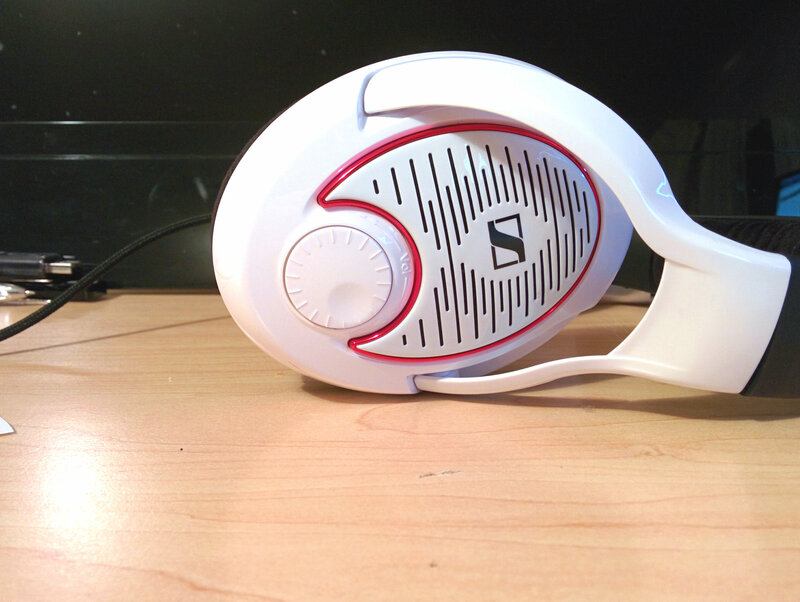 I have always enjoyed using Sennheiser headphones and thought they offered good sound quality. So I was very happy to see that Sennheiser had several different headsets available. 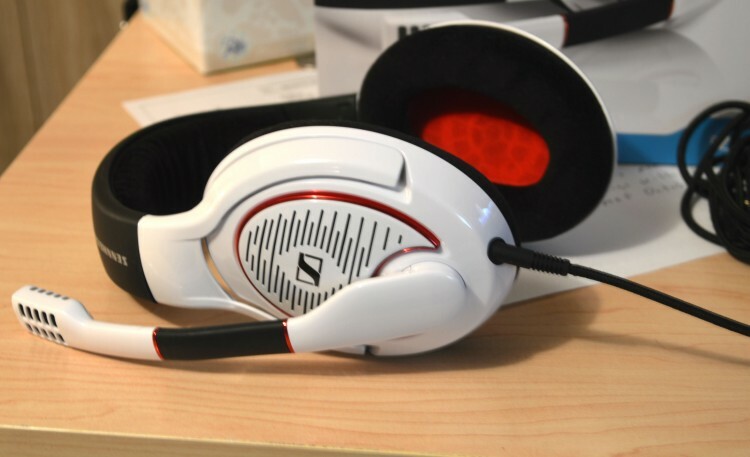 Sennheiser sells many different headsets starting from $50 dollars up to the $270 dollars. Most of their headsets have really nice features but I choose the G4me One gaming headset. 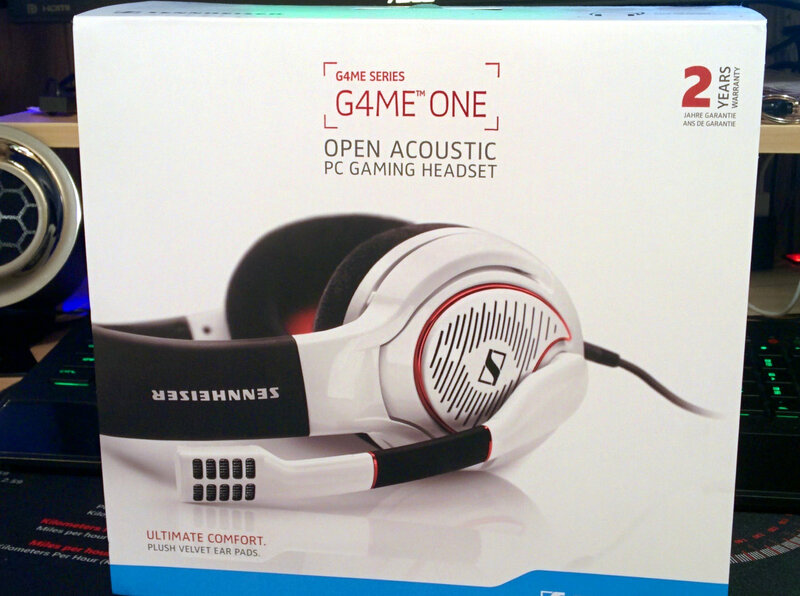 Sennheiser has two G4me series gaming headsets the G4me One and G4me Zero. 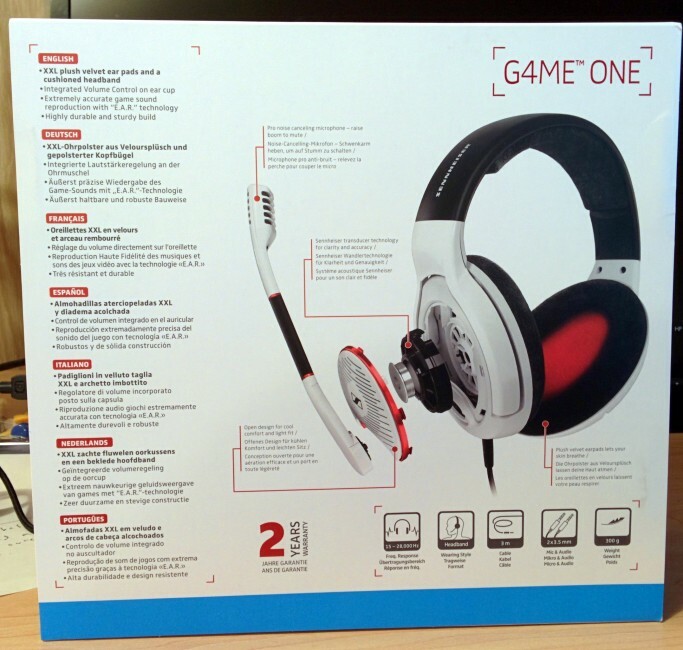 The G4me headsets come in both Black and White and I choose the white version which looks very good. Now down to the specs of the G4me One headset, the headset is an open acoustic PC gaming headset, the headset is large and even larger than my old SteelSeries headset which is good for people like me with big heads. Unlike most high-end headset that are made out of metal or carbon fiber the headset if made out of plastic. This may seem like a downside to the headset but it makes the headset light and easy to wear. 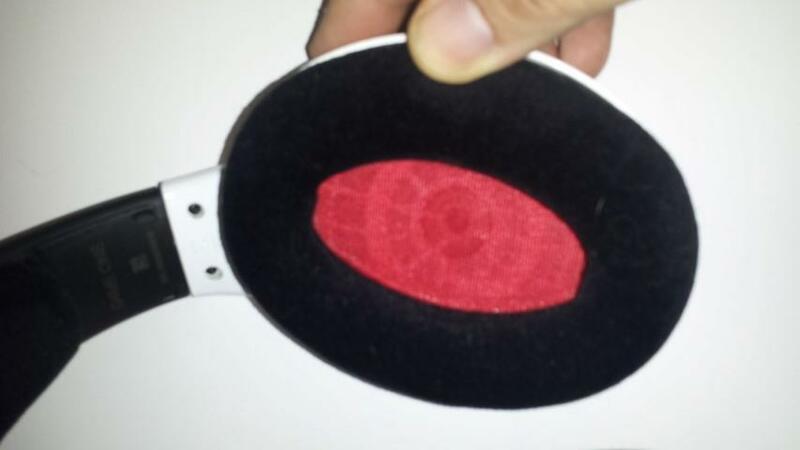 The headset has a velvet cushion on top and extra large velvet ear pads which fit and feel really good while worn. The open ear cup means the is air flow and your ears wont get hot while wearing the headphones. The headset has a boom mic on the left side that has noise cancelling built in. One feature I like is the ability to mute your mic by pulling it back to the vertical position which makes it easy to mute your mic without having to set a keybind. One the right side of the headset there is a volume knob that allows you to adjust the headset volume. G4me One headset has a long 3 meter braided cable with both a mic and headphone 3.5 mm jacks for your PC. You can purchase an adapter to use the headset with gaming consoles for $15 dollars. The listed specs and features was enough for me to purchase the G4me One headset for $250. Once I received the headset I was not disappointed. When I put on the headset it fit great on my head and on my ears without any pain with my ears. The headset has very impressive audio and sounds excellent. It is even good even for audiophiles to use to listen to music. The G4me One headset does great with music and movies as the sound is very rich and crisp. Even though the audio sounds great on the headset it may not be the best fit for gamers. Unlike other gaming headsets that lets you use audio enhancements to improve your gameplay the G4me One headset does not give you any customization to your audio settings for the headset. Besides changing the master headphone volume on the right ear cup and muting the microphone by flipping it up, you can’t tweak the audio in any way. 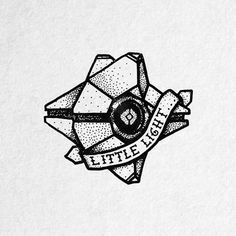 Most gamers want ability to easily crank up or turn down the voice chat or switch between simulated surround and stereo audio. Most gaming specific headsets have some mixing function that can increase voice chat and making it higher than the sounds of the game itself. The G4me One headset is lacking this ability and that may turn off gamers over other headsets. So after all of this my personal thoughts on this is I like the Sennheiser G4me One headset it is comfortable to use with the open ear cups. As for the cons of this product they are several that will make you check to see what you want out of your gaming headset. If you are used to the being able to tweak your audio settings then this is not the right headset. But if you are like me and want quality audio in your headset without needing to tweak audio settings you should check the Sennheiser G4me One headset. I hope this review has helped and let me know if you have any questions.